July 22, 2018 – Jacquelyn Pryor, Ph.D.
August 04, 2018 – James G. Coe, Ph.D.
August 12, 2018 – Lillian Arleque, Ed.D. 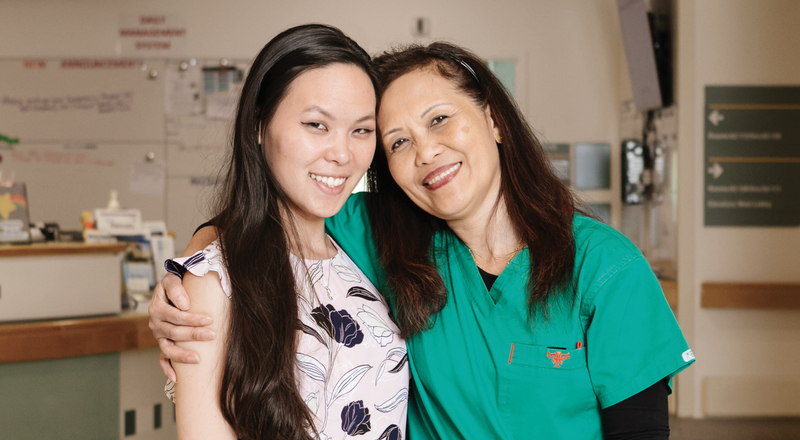 Jenni Chang is an exceptionally caring, loving and special nurse. Most important, she serves as an inspiration to our oncology patients, as she survived and fought very hard for 28 months to overcome cancer herself. Jenni’s experience as a survivor of pediatric leukemia makes her the perfect nurse to connect with patients and their families — she can truly empathize with the positions and predicaments in which our veterans with cancer find themselves. She has used the trials and struggles she faced growing up as a teenager with cancer to become someone who fights the battle one day at a time, one patient at a time, giving her time and energy to devoting the best possible care she can provide to her patients. She wants to restore their hope and faith and be the backbone and foundation that they and their families can lean on when they feel like no one else understands what they are going through. She relates to patients and their families like no one else can. One patient she connected with, Mr. RB, received a diagnosis of oral cancer almost three years ago. He was a patient of hers from the very beginning, and she became his favorite nurse. Not only did she treat him with numerous chemotherapy regimens, but she also sat with him daily throughout and during his admissions anytime she was working, regularly checking in to see how he was doing. When something changed with his treatment plan, he’d call her regularly to inform her if things were bad or good, always looking to give her that “big, smiling hug” we all wished we could receive. She treated him through three chemotherapy regimens, years of intermittent radiation, over 10 surgical procedures and numerous clinical trial treatments. She was always there when the oncology clinical nurse specialist was unavailable; she took it upon herself to take the time to talk and sit with him, sharing experiences, providing explanations on treatments and side effects and what to monitor when he went home. She was always educating and teaching him things he might expect post-treatment, and he would show such thankfulness for her knowledge, time and compassion. After years of fighting, Mr. RB learned that his cancer had spread to his lungs and required weekly paracentesis. Never will I forget the moment she came to me after seeing him, knowing it would be the last time before he was discharged to his home with hospice services. I witnessed him telling her at his bedside, “They’ve been able to treat everything and given me new body parts and teeth, but they can’t give me new lungs.” She became so overwhelmed, she began to cry. He told her, “You must continue living life and enjoying life and keep fighting — and know that I will be there with you. This cancer should have gotten me in six months; you helped me get to over two years, almost three years.” She took his hand and promised she would. It’s not often our patients touch us in this way, but Mr. RB was thankful for her and the time she was able to extend for him to see his wife, children and grandchildren, he said. Her ability to reach and touch our patients on a clinical-skill and emotional level is beyond measure, not just for Mr. RB but also for many of our patients. Sharing her personal experience allows her to connect and show great empathy with patients and their families. Jenni continues to show great initiative and drive to help these veterans as a way of giving back for the great care she received during her personal journey with cancer. After years of getting to know Jenni, personally and professionally, I would pick her to be my nurse, as well, because of the compassion and dedication I have seen her show to her patients and their families.